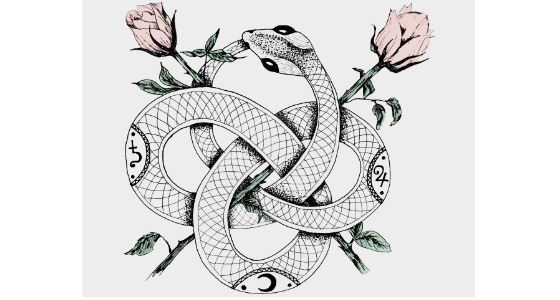 The idea of the Ouroboros, or tail-eating serpent, first lodged in my mind during an organic chemistry class when I was 18 and in my second year at the University of Pretoria. By then I had already met Peter and we had moved from being “just friends” to “going steady.” We were in class together as our professor recounted the “vision” of German chemist Friedrich August Kekulé (1829-1896) that gave him the clue to the structure of the benzene ring. In the 7 years that followed, Kekulé became practiced in receiving and developing helpful images in this way. By then he was in his early thirties and a professor in Ghent in Belgium. One evening, during an evening nap by the fire in his darkened study, he again saw—in a Traumerei, or reverie—atoms “gamboling before my eyes.” Now his inner sight “rendered more acute by repeated visions of the kind, could distinguish larger structures of manifold conformation: long rows, sometimes more closely fitted together all twining and twisting in snake-like motion.” Then he was startled to see one of the “snakes” seize hold of its own tail, and whirl “mockingly” before him. He was jolted out of his languorous state, “as if by a lightning bolt.” He spent most of the night that followed working this up until he had shaped his theory about the structure of benzene. The tail-eating snake is one of the oldest re-appearing icons in mythologies all over the world. According to ancient Egyptian legend, when the sun god Ra merged with Osiris, ruler of the underworld, to form a new divine entity, two serpents representing Mehen, “the serpent god of protective coils,” slithered around the newborn super-god holding their tails in their mouths. Left, “Afur-Asahr saith unto Osiris, who dwelleth in the serpent Mehen, Hail, Osiris, Governor of the Tuat, thou lord of life, thou ruler of Amentet, thou shalt live, live thou life, thou hast magical power, and shalt prevail by magical powers.” Right, in one of his many forms, Ra, god of the sun, has the head of a falcon and the sun-disk inside a cobra resting on his head. See how rotundly the snake curls around the cobra. Left, the snake circle in Native American art. Right, the evolutionary snake eats its tail. While I was amused to see that the part of the snake’s tail that is disappearing into its mouth is labeled GUT, in this context the acronym actually stands for Grand Unified Theory, a model in particle physics in which, at high energy, the interatomic electromagnetic, weak, and strong interactions, or forces, are merged into one single force. I was awake, maybe daydreaming, when my Orobos manifested itself the other day. I have no doubt, though, that the notion had been cooking in my head since we moved from our house in Roberta Street into our Wilmington Flats apartment. Or maybe it had been cooking all my life: Carl Jung considered the Ouroboros icon to be one of the primordial archetypes of the human psyche. It usually represents cycles, eternal return, infinity, completion, and self-containment on a cosmic scale. Left, our apartment block, Wilmington Flats, as seen from the street. Right, Peter is standing by what used to be a gate to the small nature reserve, Hidden Hollow, which is now our back yard. Now the gate serves as a historical marker rather than barring anyone from the little paradise. I experienced my “vision” just the other day while contemplating from my study window the river in the small nature reserve that lies behind our building. Suddenly the actual panorama before me shifted from my mind’s eye, to be replaced with an image of completion: the river’s serpentine curves twisted around and grabbed the tail of the river of my childhood. Left, the black curve of the river through the snow—Parley’s Creek—is visible through the trees. Right, now that Hidden Hollow is greening, the river is harder to see through the trees. The visible curved line is a walking path that follows the river’s curves. Parley’s Creek is a tributary of the Jordan river, which has its headwaters at Utah Lake and flows northward a mere 50 miles until it dead-ends in the Great Salt Lake. If Parley’s Creek is my snake’s tail, its head is the Sterkstroom river (it would be known as a creek in American vocabulary) near my grandparents’ house on the Steenekamp family farm in South Africa where I grew up. When we arrived on the farm from Cape Town where my father was a refrigeration engineer, we lived in the old farmhouse with my grandparents. Soon we moved to a small house within walking distance. The photo above is not of the Sterkstroom river on our farm, but of a river I don’t know the name of in the Koster area, which is 95 km from our farm. I do not have a photo of the actual Sterkstroom. Above, taken when we had just arrived on the Steenekamp family farm in 1953. From left, my mother, Susan Steenekamp, holding our baby brother Klasie; Gerda(4); Lana (2); my father’s father, Johannes Nicolaas Salmon Steenekamp. We lived near the river from when I was 4 years old until I was 6 and in Grade 2 (same as second grade here—I was always young in my grade, since I went to first grade at 5 and then skipped a year.) My same-age cousin, Hendrik, and I started exploring the river before we started elementary school. From our grandparents’ house, a walk of just a few hundred yards took us through the lane of quinces that edged their yard, across a patch of worked land, and on to an apparently impenetrable barrier of grey-green growth. When we came to the end of the worked lands around my Oupa and Ouma’s house, we faced a wall of grey-green sage interspersed with other indigenous trees and shrubs. In the middle of the greenery, a dark hole marked the access to the river. The portal was small even for a child: when we stepped into the dark shade inside, we had to hold up the overhead growth to be able to stand upright. As we moved toward the circle of light ahead, sharp twigs and branches scratched my arms and legs. Hendrik, who led the way, stepped first into into the soft sunlight coming from the glint of water at our feet as much as from the filtered rays above. When I emerged beside him, there it was: a river made for children. In retrospect, my hazardous crawl through the tunnel and arrival in the sun-filtered light of the riverscape had all the elements of a Jungian journey to the underworld and rebirth to new life. Above: the center photo shows all of our cousins who came to the big farmhouse where my grandparents lived for the celebration of all holidays. The tallest cousin at the time, I went in the back row with the tallest boys. My same-age cousin, Hendrik, with whom I explored the river and other exciting features of the farm, is the second-tallest person in the back row. He is standing next to me, on the left in the photo. (He is by my right side.) This was Christmas Day, 1957. The inset photos on the sides are the cousins who were babies and asleep at the time the photo was taken—or not yet born. The exception is 2 bottom photos on the right: the girls are sisters Dawn and Lucretia who then lived in England and would only join us on the farm a year or two from this day. All the girl cousins in the center photo are wearing dresses our mothers made out of a roll of white fabric that my Ouma ordered every year as our Christmas gifts. Here in Utah the Sterkstroom would be called a creek. The day I first saw it, it was barely flowing. A hopscotch of rocks led to the other side. Hendrik and I immediately jumped across, our bare feet finding good purchase on the stepping stones. (We always walked barefoot on the farm—most children even went to school in bare feet.) That day, and uncountable times after that, we played on the far bank where the shrubbery did not come right up to the water. We threw rocks for a big splash, floated leaves and sticks, and climbed fallen tree branches. Above, my siblings and I in 1957. The photo was taken on the same day as the one of the cousins. From left, Klasie (4), Gerda (9), Carel (1 1/2) Lana (7). Once Hendrik and I started taking the bus to school in Marikana, about 5 miles away, we no longer played at the river near my grandparents’ house all that often. Instead, we got to know very well the “drift” (or shallow part of the river) that the school bus crossed. There was no bridge. As Hendrik and I earlier did at “our” part of the river, the bus hop-scotched across the rocks high enough to emerge from the water that formed rough tracks for the crossing. Now and then the river was in spate after the thunderstorms that boomed through my childhood and the bus driver had to stop and check the flow to determine whether the bus could cross. In an irony made more vivid in these present days of parents being prosecuted for allowing their children to walk to the park on their own, the driver on one occasion sent the Standard 5 boys (seventh-graders aged 12-13) into the roiling waters to see how strong the force was. Fortunately no tragedy ensued, enabling my scruffy, dirty-fingernailed, foul-mouthed schoolmates who often teased my little brother Carel (because he was so smart) to be upgraded in my estimation to heroes, albeit of the villainous kind. The last photo of me with my siblings on the farm. It was 1966. I was 16 and in my first year at the University of Pretoria. My uncle, who had a camera, came over to our house to take photos of me and my family for me to send to my host family in Breda, Iowa, USA, where I was about to go as an exchange student for a year. When I came back, my parents had sold the farm, which had fallen into financial difficulties after a 7-year drought. When I came back from the US, my parents had moved from the Transvaal province to the Free State, to a small town, Heilbron, which was 235 km (146 miles) from our farm. I went home to an unfamiliar house in Heilbron, where my father had found a job as a refrigeration engineer on a chicken farm. I never got to say goodbye to my childhood Xanadu in person. In the photo from the left, Klasie (12) with Boshoff (5), Tertia (4); Carel (10), our dog Mientjie, and me. My and Peter’s new river has no parasitic dangers we know of, but a sign on its northern bank warns against high water or flash floods whenever it rains in its catchment area. We had a spring snowstorm today, one in which winter and spring meet in the white pear blossom petals mingling with the snowflakes. Even from our windows we could see the river rising at least a foot above yesterday’s mark. Above, snow flakes mixing with white pear blossom petals. Yesterday, by contrast, was a lovely mild and sunny spring day. Peter and I could not resist the temptation to play by the river. As soon as I had enfolded Parley’s creek within my heart as an element in my personal mythology, my brain greedily completed another circle in relation to a second vivid memory of our farm: at the Hidden Hollow, exit that leads to Sugarhouse Park, I found an equivalent for our koppie, or rocky outcrop, on the farm. In our farm koppie, my siblings and I one day discovered a cave with a jackal skeleton inside. The photo above is not of “our” koppie, but of one in the Phalaborwa area, about 500 km away and near the Kruger National Park. I show it to give you an idea of how suddenly a koppie rises from the flat veldt. Above: This is the only photo I have of the koppie on our farm, taken in my childhood. From the left, my brother Carel, my brother Klasie (who died a few years ago), my mother with my baby brother Hennie-Boshoff, and me. It was taken by my school friend, Jeannine du Toit (now Dr. Franklin), who was visiting from Pretoria and had a camera. I was 13 years old and in Standard 8, which is the equivalent of a sophomore in high school. So far, Peter and I have had no drama yet at our new “koppie,” other than that I climbed up a few feet to rescue Dante and then had to be rescued myself! To get to our Sugarhouse koppie, you follow the walkway beside the river to the east, then cross the river via a rustic wooden bridge. Continuing on the walkway, you get to a tunnel that takes you under a busy street, 1300 East, into Sugarhouse Park, considered a “crown jewel” among regional parks in the Salt Lake Valley and comprising “110.5 acres of lush, rolling green space in the Sugar House neighborhood of Salt Lake City.” An area consisting of the lead-up to and outlet from the under-street tunnel is called The Draw: it consists of human-made red rocks sculpted to mimic the landscape of many of Utah’s national parks. Left: the green rectangle on the very right is a view of Sugarhouse park through the tunnel at The Draw. Right, our “koppie” even has a cave. It is not hidden, dark, and dramatic like the one in our koppie on the farm, but has the merit of Peter’s closeness—although we did visit the farm when we were in our 50s, he never got to see the koppie or the cave. When you exit the tunnel, you get to Sego Lily Plaza, a continuation of the red-rock landscape, arranged to resemble Utah’s state flower from an aerial view. It will be completed this year, 2018. Left, artist’s sketch of the seagull-eye view of Sego Lily plaza. (The seagull is Utah’s state bird.) Right, at the top middle, you can distinguish Peter (against a background of dark green trees) attempting to scoot down along a vein of the Sego lily leaf shown on the right of the sketch–its veins are surrounded with green to indicate future plantings. Left, Peter practising a salsa step onthe leaf depicted at the top in the sketch. Right, Gerda attempting a jump down a shallow rock step on the same sego lily leaf. From our walk back home along the river, I salvaged a weathered leaf, worn down to a lacey structure during the winter. At home, I stuck it to the window in my study. As I was writing this piece and looking on the internet for Ouroboros illustrations, I found a picture that made my skeletal leaf loop together with another memory from my past, this one from my and Peter’s “courting” days at the University of Pretoria: we used to leave notes for each other signed with the infinity symbol. A lovely essay, Gerda. I grew up in Salt Lake and for a time lived near 21st East and 21st South. The Sugarhouse Park was the site of the Utah State Prison, it was very scary around there. We used to drive past it all the time and I always hated looking at the menacing building. I’m pleased to know a site with such a negative past has become a refuge and place of beauty in the city. Thanks so much for your lovely note, Dianne. How wonderful to hear that my snake-biting-its-tail post prompted your snake to bite its tail too: You can be assured that the prison vibes are now totally gone from the Sugarhouse Park site. I hope that you will be able to come and soak in the peace and beauty of the new disposition yourself. Let me know if you ever have the chance to come here, and we’ll go for a walk so you can tell m your memories! What a wonderful read and I’m so glad to see where you settled and your new adventures ?. We still have boxes to unpack but we are now settling in and exploring our new home in Ahwatukee Arizona. Sending my best ? I had a lovely stroll through your Facebook page yesterday–your new home seems so idyllic, and seems to come with an already-existing art community. Peter looked Ahwatukee up this morning, and we saw a satelite image of your neighborhood–how lovely it must be living at the foothills in a nature-friendly environment. Ah, those boxes–we are down to one or two. But I see you are already creating. Once you start to do that, you are HOME. Wish you everything of the best. So glad to read your latest essay. I have been missing you for the last few months and chalked it up to the fact that you all were moving. It seems you new place is wonderful and most fitting for the two of you. If you have a free afternoon in the next week or so I would love to meet for lunch and catch up. Always love to hear from you. So lovely to hear from you, Kathy. Yes, I was pretty overwhelmed with the move, but we seem to be settling in despite another box or two to be unpacked. We love our new place. Would so much love to see you. My lunchtimes next week are pretty open. Let’s find a time by e-mail, because I don’t check this every day. Can’t wait to catch up! Baie interessant Gerda, en soos gewoonlik boeiend.Groete van die ou niggie down South. I love your definition of “my serpent bites its tail.” I experience it in much the same way. I often find my serpent wiggling, like Kekule’s, when I am about to go to sleep. Your appreciation of my writing means so much to me.Thanks for being in touch. Such a fun read, like you and siblings, me and my 3 brothers explored the world on our own from a very young age. During the summer we might make it home for lunch, most days we would not make it home till dusk. It didn’t matter that we grew up in the suburbs of San Francisco, every day was a new adventure. Your new home looks perfect. What a wonderful essay. Dankie, Gerda! Baie dankie, Poen. Jou waardering beteken baie vir my. How wonderful to hear from you, Carina. Peter and I are really having a wonderful time living in our new place. Thinking of you and your lovely family. HOpe you are having a great time with Daegan and all the wonders a child brings into one’s life. I am seeing the wonder of childhood anew through my grandchildren. I wish they could get together with their cousin! love you very much. Dearest Gerda, we your family so enjoyed reading your serpent-bites -its -tail reverie; your essay is so beautifully written with a dreamlike quality and we identified with your reminiscing as we too spent endless magic hours at our river on the Bushveld farm. Dearest Ria, I felt the same “farm” feeling when I went to your Bushveld farm than I did in my childhood. I first went there a year or so after my father lost our own farm. I did not realize then that the Bushveld farm would be my last experience of “farmness” and proximity to a river that I would have until now. Thanks so much for your kind words about our move to Sugarhouse. It would complete another circle for me if you and Cliff could be here to enjoy it with us. I have to say, though, that with all the gardens I have had in my life, that I still have “garden envy” for the little paradise you created in the back at your flats. Some people move to rivers, others–YOU–bring the riverness to themselves! We love you endlessly, serpent-biting-its-tail-ly.